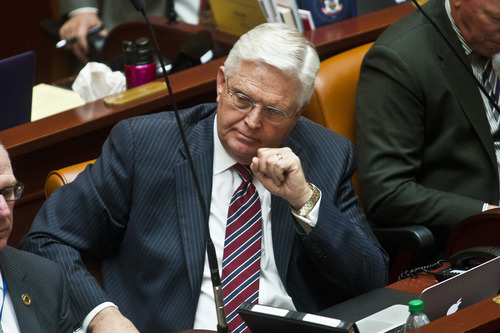 Utah Legislature • Snow willing to step aside if House leaders see a conflict of interest. Chris Detrick | The Salt Lake Tribune Rep. V. Lowry Snow, R. St. George, listens during a special session in the House of Representatives at the Utah State Capitol Wednesday July 17, 2013. 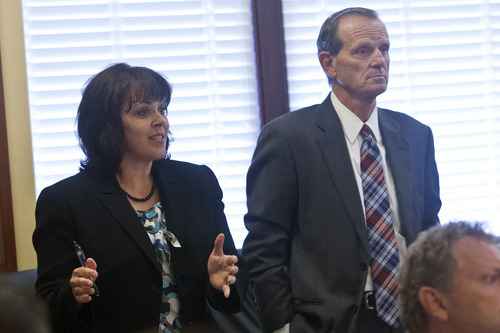 Chris Detrick | The Salt Lake Tribune House Speaker Becky Lockhart, R-Provo, talks as House Majority Leader Brad Dee, R-Ogden, listens about the possibility of impeaching Attorney General John Swallow in the Utah House Republican caucus room Wednesday June 19, 2013. The St. George attorney and legislator tapped to head the special House committee investigating Utah Attorney General John Swallow has links in several lawsuits to Jeremy Johnson, the St. George businessman at the center of the controversy engulfing the state&apos;s top cop. Republican Rep. V. Lowry Snow said Thursday he doesn&apos;t believe his role in the cases would impede his objectivity, but he plans to meet with House Speaker Becky Lockhart, R-Provo, and is willing to step down if she believes it creates a conflict of interest. "It&apos;s a fair question," he said. "Personally, I don&apos;t think it is [a conflict]. I feel like I can act independently and act in the investigation appropriately. But leadership may feel differently." Snow said he did not discuss his involvement in the cases when he met with Lockhart about his committee appointment Wednesday. Lockhart was traveling Thursday and could not be reached, but House Majority Leader Brad Dee, R-Ogden, said legislative leaders would have to examine the matter. "I guess we&apos;ll have to look at the case and see what his firm represented and if it indeed represents a conflict of interest," Dee said. "I&apos;d have to see exactly what the case is, how it involves Mr. Johnson, how it involves Representative Snow&apos;s firm." Lockhart appointed Snow on Wednesday to lead the nine-member bipartisan panel, whose work is expected to focus, in part, on Johnson&apos;s relationship with Swallow. In a 2008 lawsuit, Snow, former president of the Utah State Bar, is listed as representing several clients, including Johnson, the St. George businessman accused in a separate federal lawsuit of scamming customers of his online sales and marketing companies. The 2008 lawsuit was filed against Johnson and his business associates, brothers Todd and Jason Vowell. Snow said he does not recall representing Johnson directly in the matter, but could not say for certain if he did. Johnson was dismissed from the suit with Snow&apos;s name prominently listed as one of his attorneys on the motion to remove him. Snow currently represents several defendants in a Federal Trade Commission lawsuit against Johnson, his I Works company and others. This suit, in Las Vegas&apos; federal court, accuses Johnson of defrauding customers. Snow represents Liahona Academy  a school for troubled youths in which the Vowells had been involved  as well as Virgin Properties, Executive Auto Group, and Executive Car Sales. The receiver in the case said those companies had dealings with Johnson&apos;s businesses and has sought to freeze the companies&apos; assets. In court filings, Snow argues Johnson was not a partner in his clients&apos; companies. "Most of the representation has been by my partner," Snow said, "but I am an attorney of record on that case." Snow reiterated his willingness to step aside from the House committee  "if leadership, for the purposes of maintaining the credibility and integrity of the process," wants him to do so. "I believe it&apos;s collateral and not related to Jeremy. I don&apos;t represent Jeremy." Corporate records show the Vowells were removed as principals in Liahona Academy in January 2011. The Vowells bought Executive Car Sales, but it was dissolved in 2011. Curtis M. Jensen  a partner in Snow&apos;s firm, Snow Jensen & Reece  represented the Vowells and Executive Car Sales in a 2010 lawsuit in which an investor alleged she was cheated out of $600,000. Jensen is president-elect of the Utah State Bar. Snow and another lawyer from his firm also are listed as attorneys for the Vowells in another 2008 lawsuit. The trustee overseeing the recovery of assets in the FTC case in Vegas has alleged the Vowells were major players in helping Johnson hide assets after he learned of the federal investigation. "Todd and Jason Vowell appear to be the individuals primarily responsible for orchestrating the movement of Jeremy Johnson&apos;s assets," the trustee, Robb Evans & Associates, wrote in a report to the Vegas court. In addition, Snow&apos;s firm was named as trustee on at least eight property transactions in Washington County that involved entities the receiver alleges were used to hide assets for Johnson. Johnson is defending himself now in the Nevada case. He also faces 86 felony charges in Salt Lake City&apos;s federal court  where he is represented by prominent defense attorney Ron Yengich  over his business dealings. A gag order in the criminal case forbids Johnson from commenting to the news media. Johnson previously has accused Swallow, then Utah&apos;s chief deputy attorney general, of helping to arrange to bribe Senate Majority Leader Harry Reid, D-Nev., to thwart the FTC probe of I Works. Swallow, who became attorney general in January, insists he only helped Johnson set up a lobbying deal, and Reid&apos;s office says it has no knowledge of Johnson or any such effort. Swallow and his predecessor, Mark Shurtleff, are the subjects of investigations by federal and county officials. Swallow also faces two ethics complaints filed with the Utah State Bar, including one by the state&apos;s former director of consumer protection alleging he violated attorney-client rules by discussing a consumer-protection case with a potential donor. Snow will lead the House committee that includes four other Republicans: Jim Dunnigan of Taylorsville, Mike McKell of Spanish Fork, Lee Perry of Perry, and House Majority Leader Brad Dee of Ogden. There are four Democrats: House Minority Leader Jennifer Seelig and Rebecca Chavez-Houck, both of Salt Lake City, along with Susan Duckworth of Magna and Lynn Hemingway of Holladay. Utah Democratic Party Chairman Jim Dabakis, who is also a state senator, said that Snow&apos;s potential conflicts show what happens when the majority Republicans control the committee. "It&apos;s frankly outrageous that there are ethical issues arising within this committee just 24 hours after it was named," Dabakis said. He said to regain trust, Lockhart should replace Snow with a Democrat to chair the committee. Swallow&apos;s attorney, Rod Snow, who is not related to Lowry Snow, said he doesn&apos;t believe Lowry Snow&apos;s involvement in the Johnson-related cases makes it impossible for him to head the committee. "His firm&apos;s concern is whether the FTC has over-reached on certain businesses [and] investors who did business with I Works before the FTC sued [Johnson] and froze his assets," Rod Snow said. "I think Lowry is an attorney of integrity and sound judgment." Swallow, who is a Republican, denies any wrongdoing and has pledged to cooperate with the panel.